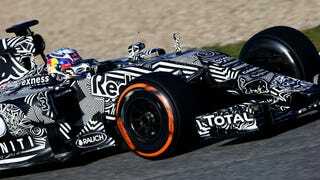 Red Bull brought its RB11 2015 Formula One car out in camo to test at Jerez this weekend. Sure, it's a bit terrible in terms of sponsor visibility, but can we keep it anyway? Seriously? The camo looks fantastic.